Being a huge fan of the Marvel Cinematic Universe and as someone who has completely bought into the lore; watching everything from the films to the TV shows and maybe even reading a few comics, I really didn’t know what to think going into Ant-Man. I knew to expect good things with it being a Marvel Studios film of course, but considering the change in direction after Edgar Wright left the project just as it started, I was wary of how much it could affect the film, but also throwing in the mysteriousness of the character and how different he was to previous superheroes seen in the MCU. It turns out that it’s a really good film all round, from being a genuinely good heist film, and taking its place in the MCU as a superhero movie. 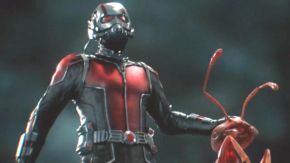 It draws on the former much more than the latter and with the fantastic acting of Paul Rudd who was pretty much perfect as Scott Lang, and Michael Douglas who portrayed Hank Pym to a tee. Evangeline Lilly was also pleasing as Hope and I have faith she will pull of a good portrayal of The Wasp in future films as hinted at in the mid-credit scene. I felt the first third of the film was a little slow to get going but this is the case for most superhero origin story films, it makes up for this the in the final third where the pace really picks up, sometimes a bit to erratic but remains entertaining nevertheless and Scott learns to control his powers, and the um... Ants. Michael Peña absolutely steals the show as Luis however, his character provides great comic relief and the narration scenes where his voice is used on every character is bordering on inspired, he’s a great addition and really makes the movie for me. His humour is just right and it fits the film perfectly, certainly far more than Age of Ultron. The amount of references to other MCU moments are great, non-more so than when Ant-Man and Falcon have a fight at the new Avengers facility. My jaw dropped when I saw the big Avengers logo and the whole scene was a real joy to watch. Cameos by Hayley Atwell playing an aged Peggy Carter and John Slattery as an older Howard Stark was just great to see and showed how confident this film was by opening with this scene. The de-aging of Michael Douglas was simply brilliant and just goes to show how much better the effects have gotten since the terrible CGI Jeff Bridges in Tron Legacy from a few years ago. Despite the odd pacing and director dropout, Ant-Man is a solid movie, and is absolutely fit to be in the MCU. There are perhaps some similarities to Iron Man but that’s not necessarily a bad thing. The villain is also (like most Marvel baddies) a bit weak and lacks backstory and requires fleshing-out. He would have benefited from a few scenes more, with the exception of Fisk from the Daredevil TV show, and maybe Loki, this is becoming a problem for most MCU baddies and has to be addressed if Marvel want to continue past 2019 at this rate. The post-credit scene, also, whilst a bit mysterious and lacking in context, got me really excited for the third Captain America film next year, and upon hearing that the scene was lifted directly from Civil War, I’d say this was the best post-credit scene since The Avengers and the reveal of Thanos in my opinion. Ant-Man is not the best MCU movie, but it’s entertaining and a somewhat refreshing change to the usual Avenger tirade. It acts as a breather, a chance for the audience to catch its breath at the end of Phase 2 before being furiously plunged into a hectic Phase 3 next year. The subtle hints of world building where great and it’s just an all-round fun movie to watch without overdoing the comedy or action. I look forward to seeing Ant-Man in Civil War next year, and who knows, maybe even an Ant-Man 2 in Phase Four? I certainly would have no qualms.